Sarah (Sally) Davidson Alexander (1807-1864) was an adult, aged 25 years and 9 months, when she finished her sampler. She was the daughter of William Bain Alexander and Violet Davidson. She never married, and spent her time visiting members of her extended family in Tennessee and Alabama. She is buried in Hopewell Presbyterian Church Cemetery, Huntersville, Mecklenburg Co., North Carolina, where the family lived before moving to West Tennessee. This sampler was not examined by TSS, and its current location is unknown. 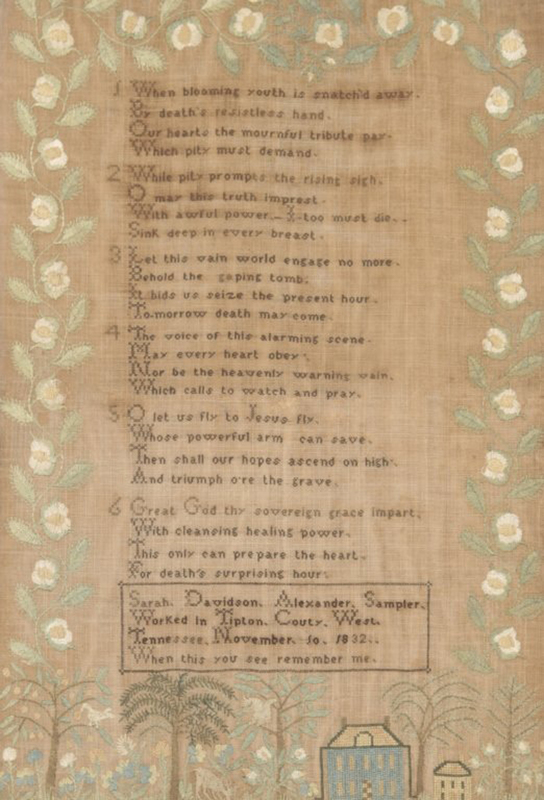 It shares stylistic traits--the long narrow shape and the large, free embroidered roses--with two samplers (TSS 184 and TSS 185) from Blount Co., East Tennessee, over 350 miles to the east. Sarah’s genealogy shares many family names with Eliza Jane Naomi Baine Ramsey (TSS 075 and TSS 076), suggesting a connection to another East Tennessee sampler maker. She probably also has a family connection to Matilda Golden Alexander (TSS 110). Her six verses are from the poem “At the Funeral of a Young Person,” by Anne Steele (1717-1778). Photograph courtesy of Wooten & Wooten.